Writer/s: James Gunn (written by), Dan Abnett, Andy Lanning (based on the Marvel comics by), and more. 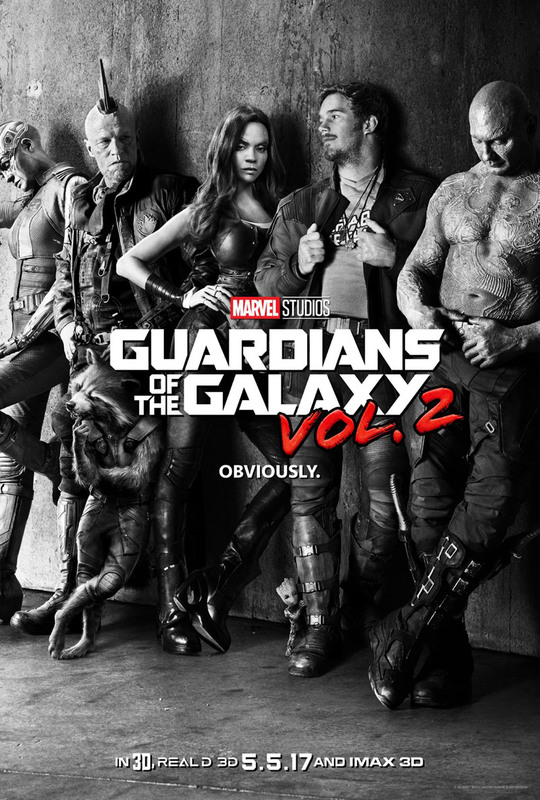 Starring: Chris Pratt, Zoe Saldana, Dave Bautista, Vin Diesel, Bradley Cooper, Michael Rooker, Karen Gillan, Pom Klmentieff, Kurt Russell, and more. So what happens when you get a director that specializes in off-the-wall odd and gory/gross films (yes I am looking specifically at you ‘Slither’ and ‘The Belko Experiment’), and tag him for a Marvel superhero film? You get the Guardians of the Galaxy, and three while we are at it! Coming off a wildly successful first installment and now deeply rooted in the future of the Marvel Cinematic Universe; James Gunn presents the film world with ‘Guardians of the Galaxy Vol. 2’. So here we go ladies and gents, the Oberrated review of ‘Guardians of the Galaxy Vol. 2’. SHOWTIME A-HOLES! I am going to try to keep this as brief as possible but I truly think I could go on for pages singing about this film as there was truly not much for me to nit-pick or be upset about in the least bit. To begin, I guess we can just start with my overall receiving of the film and that result was that this was some of the most all-around fun entertainment I have had the pleasure of watching. It was a beautiful blend of cinematic sequences, action, comedy, layered characters with the unraveling of some as well as the more mystery added to others, and overall just a fun as hell time. As the story began and progressed, in my opinion, it was very unorthodox but in the best way possible. Specifically speaking, the conflict, nor even the villain were presented until far into the film. There were teases of something villainous going on beyond anything that was presented on screen but you could not gather what that truly was until it finally revealed itself. Now with this being the structure of the story, at first I will admit that I was getting antsy and annoyed that there was not a villain so far into the film. However, once everything started to get going and the reveal happened, I was all for everything happening in the film. Speaking of the villain, without spoilers, I must say that this may very well be the strongest villain performance in the Marvel Cinematic Universe, in my opinion. Lastly, in regards to the overall plot and specifically the ending, I was way more satisfied with how this sequel ended versus the ending to the first. Not saying I did not enjoy the dance-off, this ending just felt more right. I hinted to layered characters earlier and I wish to expand on that a bit more. I find it incredibly impressive what James Gunn does with these characters. Now, while this film is primarily focused on the story of Peter Quill/Star-Lord (Chris Pratt), it does not abandon the other co-stars of this film like some films do when housing so many intricate characters, and even the supporting characters on top of that. While some get proper attention to keep the audience hooked on their characters, others got enough attention to spark curiosity on what either happened in their past or what could happen in their future. James Gunn has gone on record about what character Vol. 3 will focus on but in case it is not common knowledge, I will let you figure that out on your own. Regardless, this character’s story is very well set-up for the next film and should have everyone excited with the result of how Vol. 2 has been doing. ‘Guardians of the Galaxy Vol. 2’ is yet another perfectly imperfect film given to us by the maniac that is James Gunn. It blends countless different emotions into two hours and sixteen minutes of film and does it with characters portraying various different human emotions regardless of the alien skin they wear in the film. Beyond various underlying messages Mr. Gunn may be portraying through his film as he is famous for doing, GotG Vol. 2 is a wildly entertaining film. The time flew by as I watched this for the first time because I was genuinely so invested in the film and enjoying every passing minute. The comedy, action, drama, everything, it was all excellently blended together to create yet another Gunn branded cosmic trip through the galaxy. I will make the heavy statement, I thoroughly enjoyed this sequel more than I enjoyed the first Guardians of the Galaxy, and I loved the first Guardians of the Galaxy. Keep them coming, James Gunn and the MCU! There was far too much happening in this film for me to address everything in the review but feel free to contact me anywhere you read this and let’s have a conversation! Posted in 2017 Movies, Disney, Marvel, Movie Review.Tagged Bradley Cooper, Chris Pratt, Dave Bautista, Guardians of the Galaxy, Guardians of the Galaxy Vol 2, James Gunn, Karen Gillan, Kurt Russell, Marvel, Marvel Cinematic Universe, MCU, Michael Rooker, Pom Klementieff, Vin Diesel, Zoe Saldana.